Facebook Friend Exporter is a Google Chrome Extension which allows you transfer all your Facebook contacts to Google+ easily. It allows you to get only the friends’ information that they share with you, such as: name, e-mails, phone numbers, screen names, websites, etc. With this Extension you can add all your Facebook friends into Google+, so here is the guide which will help you do this easily. 2. Now go to your Facebook Account and you can see an Export button will appear on Facebook toolbar on the top. Click on it and it will open a screen to start processing. 3. 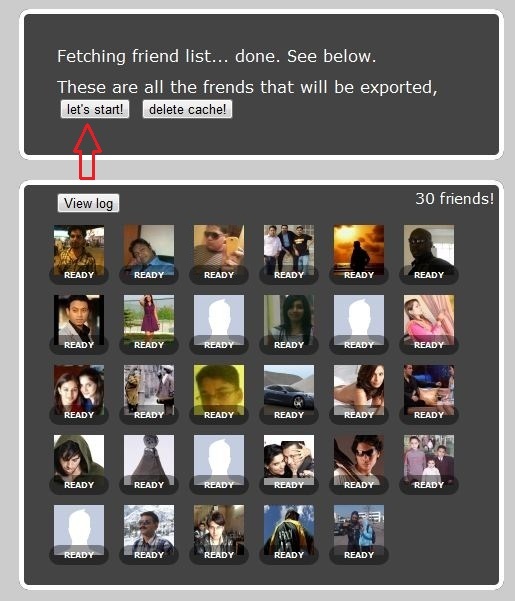 Now you can see the list of All Your Friends there, Now click the “Lets start” button and “Gmail Button” to Import all Facebook contact to Gmail. 4. After your done, go to your Gmail Account contacts page and check out the folder called “Imported from Facebook” all you Facebook contacts are saved here.